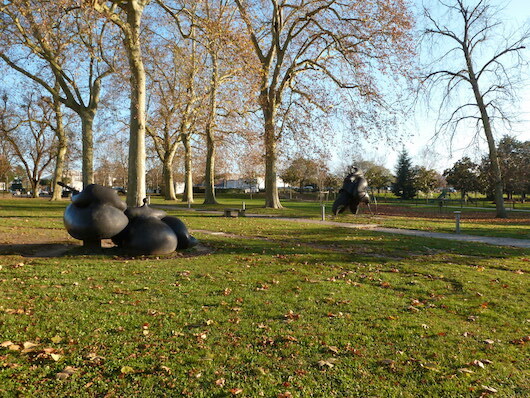 This is an exploration of the east side of Bordeaux, known as the ‘right bank’. The main features of the run are trails and paths through Cypressat and Palmer parks, which are about 1 km apart. To start at a central location, we recommend the Pont de Pierre. Run east, up Rue de Benauge, for ~1 km, crossing Blvd. Joliot Curie, onto Rue Anatole France. Do a loop around Cypressat Park, exiting on the Clos St. Romain to Rue Emile Zola, which you’ll follow into the larger and grander Palmer Park. There’s a choice of narrower, wooded paths or tree-lined fairways here, with nice view of the Garonne. There’s a running track at the northern end of the park. Exit the park using the stairs at the western end, then LEFT on Chemin des Carrières, for a rather unpleasant Note this ~2 km stretch is not very pleasant, but there is a sidewalk along the way. Turn RIGHT on Rue Bouthier down to the river, and then head south along the road/path, to the start. Add-On: The more rugged Parc de l’Ermitage Sainte-Catherine, just north of Palmer Park, has numerous trails. More of a trail run.